It’s her junior year at Arkwell Academy and Dusty Everhart just wants to be alone with her boyfriend, Eli Booker. But fate is literally keeping them apart. See, Dusty is a Nightmare, who can enter Eli’s dreams to find clues to the future, but an ancient curse predicts that any romance between them is doomed to end in tragedy. Dusty and Eli are willing to take that risk, but the authorities disagree—and have assigned a chaperone to make sure their relationship is strictly platonic. As if that’s not bad enough, they’ve been recruited by the Department of Intelligence for Magickind Secrecy (D.I.M.S.) to use their dream-seer bond to help recover the most powerful object of black magic known to magickind. The Animus Mortem can raise the dead by stealing the souls of the living… which makes tracking it down a genuine matter of life and death. To make matters worse, one of Dusty’s friends is accused of murder, and is counting on her to clear his name. Dusty has too many dreams, too many commitments, and too many people looking over her shoulder, but a Nightmare seldom plays by the rules. Curse or no curse, chaperone or not, she has to go deep into Eli’s dreams if she’s going to find the truth—and discover a way for them to truly be together at last! The Nightmare Affair. The Nightmare Dilemma. The Nightmare Charade. 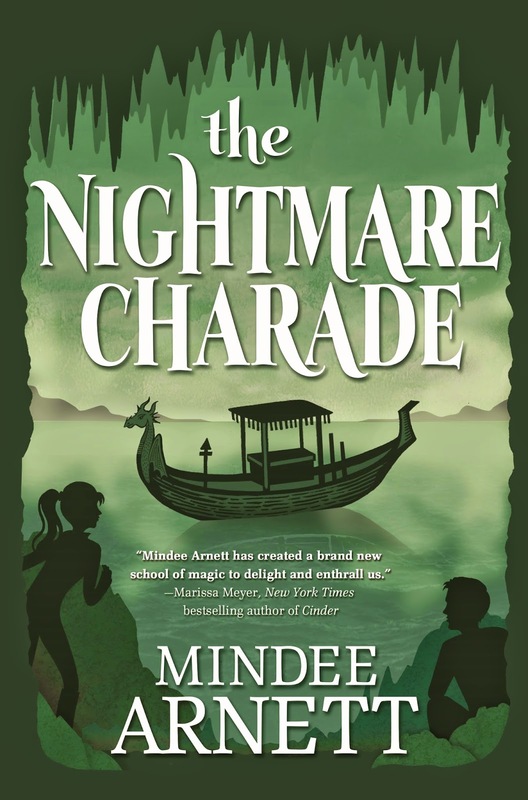 Mindee Arnett. The Book Depository. Amazon. Hello! And thanks for coming to my “official” cover reveal. By that I mean, the cover has been leaked for months now, but we’re not going to let that stop us from celebrating! So firstly, can I just say how much I love this one? I’ve been lucky in all my covers for the Arkwell Academy series, but I adore this color so much. We almost made book 2 this color, but it worked out so much better for this one. Thanks so much to the artist Kate Forester and to my brilliant editor, Whitney Ross. So what exactly are we looking at here with the strange boat and river scene? Well, if you guessed “dream sequence” then you’re right. Charade starts off two months after the end of The Nightmare Dilemma. Dusty has just returned from a summer-long tour of Europe with her mother, and she’s eager to reconnect with Eli. But of course their reunion doesn’t go as planned when they are interrupted by a magickind special agent who has come to recruit them for a special—and dangerous—task. What else can you expect? Well, there’s kissing, and magic, old enemies and new, and kissing, and scary dreams, and good friends, and action, oh and more kissing. Sadly, there are also a few casualties as well. This really is the end of the story for Dusty and Eli, but I hope you enjoy the ride! I'm so excited about this book!! And cover is so GORGEOUS!! Thank you for sharing the awesome cover Carina!! Such cute covers! I haven't read this series; I thought there was a triangle? But otherwise it sounds fun. Thank you for sharing, Carina! Ah, I love how these all go together so nicely! :D Thanks for sharing these, Carina!